Lake Mead In case you didn't know these are carp, a fish that most people avoid fishing for. If you go after these fish with the right set ups, you can have a great time. They are better scapers then most people give them credit for. 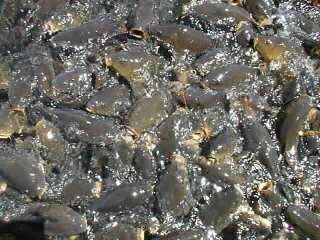 The thing to remember in any given lake or river the fish are NOT evenlyspread throughout . If you have ever looked in a fish aquarium you will seethat if there is any kind of feature , the fish will stay close because they will feel safe . Some features like fallen trees are obvious places to fish and well worth a look but these places often become fished-out due to fishing pressure . Out in a lake there are hundreds of features where the fish feel safe . There are not many lakes or rivers that have a perfectly uniform bottom or bank side. So without using diving apparatus how do we look for these features ? Normally when gravel is extracted from lakes, the method used creates long strips of gravel which are like banked seating at a football stadium . These are called gravel bars . These are excellent places to fish as not only do the fish feel safe but food tends to collect at the bottom of these bars. The fish tend to use these bars to travel around a lake in the same way we follow a motorway (interstate) . Most of the time these bar`s are invisible (being underwater) By finding the change in depth you are well on your way to finding a HOT SPOT all of your own. near the weed as there is a good chance(if they are the same depth as the weed) that they are kept clear by moving and feeding fish . I had one of my best catches ever by finding a small clear area next to lots of weed . Knowing the bottom also lets you plan what size of hook lengths to use. I wouldn't feel very confident fishing short hook lengths in a deep soft bottom like silt. The trick is finding large fish that can be caught readily. Of course, you don't have to start out with 20 pound fish. An 8 pound carp puts up a good fight, especially on light line, and is probably the largest fish caught by the majority of anglers. Chumming (the introduction of food to the water for the sake of attracting fish) is not legal in all states. So check your regulations before you start doing it. you will not catch them. Too little food and they will move on to a better place. overfeed them You can chum with anything, but the best way to start is with corn. Canned sweetcorn is the most available. After a while you will learn what to chum with, where to chum and how much. something different in the hope of attracting a fish. The neat thing about fishing is that you constantly have to try to outsmart them. cruel to the fish as foul hooking is common causing scarring and other injuries. More important is the fact that treble hooks are very large and will spook wary fish. A size 6 treble is twice the diameter of a size 6 single making it the same as a 3/0 single hook. Treble hooks have narrow gapes and their geometry is such that a good hookup is not always assured. Most trebles are of dubious quality and they have a tendency to snag on weeds, etc. and can scare off big fish. Carp will eat anything. 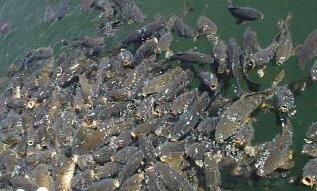 I have reports of carp eating live shad on trot lines, crawfish, hot dogs, worms, corn, maggots, spam and breakfast food.